The Elo Entuitive 1529L Touch Computer has been discontinued. No direct replacement is available. The Elo Entuitive 1529L Touch Computer integrates an all-in-one touchcomputer within the footprint of a 15" LCD monitor. The retail-rugged Entuitive 1529L Touch Computer has been designed for touch from the ground up, with such features as spill-resistant sealing, a short stable tilt base that is removable or reversible for wall mounting, and a choice of Elo touch technology as well as color. The Microsoft Windows 2000 and XP Professional versions of the Entuitive 1529L Touch Computer include a hard drive, the Windows CE .NET and Windows XP Embedded versions have solid-state components with no moving parts. Options include a magnetic stripe reader (MSR) and rear-facing customer display. 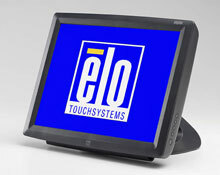 The Elo Entuitive 1529L Touch Computer offers a wide range of connectivity, including USB and legacy serial ports. Applications for the new all-in-one touchcomputer include loyalty systems, kiosk information systems, POS, casino management, cash systems, and Internet access points such as those for Web surfing and hotel reservations. 15" LCD, TouchComputer, AccuTouch (resistive) Touch Technology, USB and serial Interfaces (no parallel), Windows XP Professional. Color: Dark gray. 15" LCD, TouchComputer, AccuTouch (resistive) Touch Technology, USB and serial Interfaces (no parallel), Windows XP Professional, MSR. Color: Dark gray. 15" LCD, TouchComputer, AccuTouch (resistive) Touch Technology, USB and serial Interfaces (no parallel), Customer Display, Windows 2000 Professional, Hard Drive and Anti-Glare Surface. Color: Dark gray. 15" LCD Touchcomputer, IntelliTouch Touch Technology, Windows CE, USB interface. 15" LCD, TouchComputer, IntelliTouch (surface wave) Touch Technology, USB and serial Interfaces (no parallel), Keyboard Emulation Mag Stripe Reader, Windows 2000. Color: Dark gray. 15" LCD, TouchComputer, IntelliTouch (surface wave) Touch Technology, USB and serial Interfaces (no parallel), Keyboard Emulation Mag Stripe Reader, Windows XP Professional. Color: Dark gray.